What happens when you bring a new idea to higher ups? You hear reasons why it won’t work. People often defend the status quo, even though the present is dissatisfying. Objections express the search for certainty when facing change. When objections win, the alternative is pouring more energy into disappointing efforts. Try harder! Trying harder at failed efforts is ‘fairy dust’ thinking. Somehow, more effort will magically transform failure to success. In stagnant organizations, objections carry more weight than new ideas. The influential response to objections is curiosity. 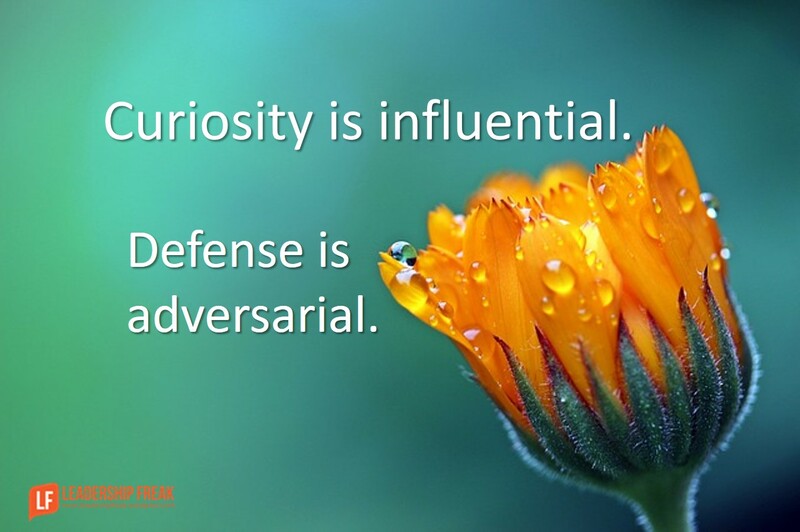 The adversarial response is defense. The worst thing you can do is quickly answer objections from higher ups. What happens when you answer objections from reluctant higher ups? They come up with new objections. It’s the frustrating ‘yeah but’ dance. Yeah, that’s a good idea, but …! Decision regarding the new idea. Positional authority isn’t the answer to objections. Forced conformity never ignites engagement and enthusiasm. Curiosity is influential. Defense is adversarial. Genuine curiosity is the influential response to resistance. People won’t hear your ideas until you hear and understand theirs. Listening is more influential than telling when earning a hearing for new ideas. Use curiosity to pivot to opportunity. I see what won’t work. (Acknowledge resistance.) What might work? I see why things should stay the same. What are some reasons why we might want to change? What do your best aspirations tell you we might try? What happens if we choose to do nothing? Where will we be in six months if we stay the course? How might leaders and managers earn a hearing for their ideas? Thanks Dr. Scott. It’s so interesting that we often prefer square wheels. That is one of the paradoxes — THEY WORK, and they work like they have been working. One participant said, “If it didn’t go thump thump, how would leadership know it was working?” — I thought that enlightening. Some managers LOVE to solve problems and live for that — if there are not any problems, they sometimes create them. Change is resisted, especially when it is someone else’s idea about what should be done differently. Instead of being curious about possibilities, we tend to prefer the known. Organizationally, we measure things that actually operate on Square Wheels, so people meet their goals. Paradox. More than a pair of ducks, for sure. Nice blog and its a real fact that People won’t hear your ideas until you hear and understand theirs. Thanks Operational… I hear you! This post offers many great conversation starters that I’m sure I’ll use in future change management situations. Thank you! Thanks for this really good post. I think one can use curiosity as an influencer even in conflict. As you mention above, adversary responses create a defensive response. When we respond using a curious approach – being present, choosing to be open and non-judging in how we listen and asking open, curious questions, we create an opening from which we (all parties) can explore each other’s perspectives. A defensive response shuts down such exploration. Once we understand the perspective of the other, we can discover ways of finding common ground upon which to move forward. Thanks Kathy. Love the clarity you bring to curiosity. “being present, choosing to be open and non-judging in how we listen and asking open, curious questions…” Part of this is letting go of our own solutions, at least for the moment. I agree – someone in a workshop once reflected that he could understand the value of curiosity, the skills were simple AND it would be incredibly challenging for him because the notion of holding himself in a place of ambiguity where he was not ‘in control’ of the solution would be very challenging. We speak of starting at a minimum emotional level of curiosity. Anything below that usually will end up in win/lose thinking. Thanks Dan! Thanks Will. Your inclusion of emotion is important. Curiosity is an emotion as well as an attitude and practice. The feeling of curiosity includes feelings of respect for others. Seeing curiosity as an emotion is not typical and greatly appreciated. It can be one of the fundamental feelings in connection, supporting relationships. I would offer some of the other feelings attached to curiosity are a sense of being open to others and non-judging of self and others. Some good ideas work and others are failures. A way to encourage creativity, whether it is an innovation or improvement, is to run pilot experiments. Leaders can also run different pilots to achieve the same purpose to see what works better or whether there is a need for improvement. R.A. — But I think Dave and I have also seen a few cultures where running a pilot is a dangerous act, exposing oneself to criticism and maybe it even being interpreted as an attempt to make the manager of that person to look bad. Your pivot questions are very powerful and strengthening. I believe the power of our mind is unleashed if we can always ask and stand on powerful questions in your pivot. Questions of value will always bring answers of value. And the beauty of the engaged pivot question is ownership by the “higher-up”, which leads to tie best accountability and ownership. Thanks Jeremy, Anytime a person owns something they begin to pull. You don’t have to push them, they pull you. Assess where everyone sits on the spectrum of what constitutes “success”. For some people, success is winning, for others, it’s not losing, which are subtly but importantly different.If your suggestion is trying to move people who are tied to not losing into a situation where in order to win you have to risk some acceptable losses, you might find it hard to get traction.